What to do for Independence Day? We’ve scoured the town for the best way to celebrate this year. Feeling like a lost puppy this year without the Fort Vancouver fireworks extravaganza? Didn’t get invited to the block party? Don’t want to spend the time, money, and singed eyebrows on your own fireworks blowout? Lucky for you we’ve found a Fourth of July fete for everyone. If you’re looking to give something back to the country that has given you independence, try some July Fourth charity events, such as the Red, White & True Oregon Wines or the Safeway Waterfront Blues Festival. Oregon wineries are hosting Red, White & True Oregon Wines, an event with picnics, wine (natch), and live entertainment, to raise money for Ecotrusts’s Farm to School program, a service that educates students about agriculture and brings more Oregon-grown food to schools. This year’s Waterfront Blues Festival, in addition to benefiting the Oregon Food bank, has top talent like Keb’ Mo’, Johnny Winter, Magic Slim, and our own renaissance woman Storm Large on the bill. There’s plenty of options for family friendly fun—check out the Oaks Park Fourth of July Fireworks Celebration. Spend the day with the rug rats on the roller coaster, Ferris wheel, and chowing down on delicious amusement park cuisine, then end the day with a bang, as fireworks detonate overhead. Feeling a might peckish? Many upscale eateries with excellent window or rooftop views will be having specials for the kid-less crowd. 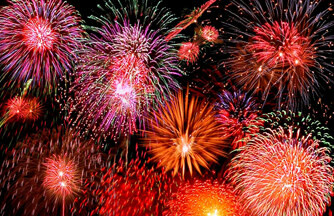 For example, Clarklewis restaurant is hosting an Outdoor American Dinner Fireworks Party. If hot dogs and potato salad aren’t floating your boat, feast on gourmet food with a classic Fourth of July flavor. For Portlanders who enjoy our national pastime, the Portland Beavers host the Colorado Springs Sky Sox at PGE Park. The first 1903 fans will receive patriotic ball caps, so get there early. Before the game, catch a few innings of Vampire Baseball, a fun charity event for the Make-A-Wish Foundation. Some of the stars of Twilight will be playing a little ball before the Beavers take the field. After both games, enjoy a fireworks show. Berbati’s Pan hosts electronica and break-beat artist Tipper on the Fourth for some decidedly nontraditional entertainment. Tipper creates ideal music for robot dancing. So, whatever your taste and patriotism level, there’s plenty to do on Independence Day. For more Fourth of July activity ideas, including some without a hot dog or firework in sight, please see our Events Calendar.